A late Sam Simpson penalty ensured Thornton Hibs were defeated as Carnoustie Panmure ran out 1-0 winners. 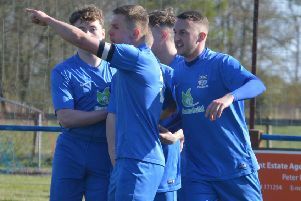 Having won the first game of the season when the teams last met, Carnoustie travelled to a blustery Memorial Park looking to complete the double over Thornton. Using the strong wind to his advantage, Gowfers’ goalie, Jamie Robbie, launched a long ball down field in the fifth minute, which caught the Hibs’ defence napping but Jamie Winter was unable to take advantage as he clipped the ball wide of the far post. Minutes later Adam Drummond went down in the box when Bruce Hearn appeared to pull him back but the referee judged that no infringement had taken place and waved played on. The ball was immediately worked to the other end with Scott Costello denying Simpson what looked like a certain goal and not long after that Costello again came to Thornton’s rescue with a terrific flying save to stop Simpson once more. 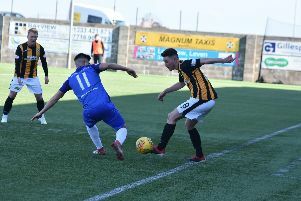 Daniel McNab came close with a header, which went narrowly wide before Robbie made his first decent stop in the 52nd minute from McNab’s shot and the visitors’ number one made a terrific save when he back-pedalled then tipped over Matthew Robertson’s dipping effort. There were loud appeals from the Hibs’ players for a penalty for handball when Stuart Drummond’s fierce drive was blocked at close range but, again, the referee was having none of it. Gowfers’ substitute, Gordon Macdonald, was presented with a good chance to break the deadlock in the 73rd minute but he shot wide. Just when it looked as if this game would end goalless, an injury time challenge on Simpson by Millar was deemed to be illegal with Simpson finally getting the better of Costello from the spot. Hibs: Costello, Robertson, A.Drummond, Millar, Shields, S.Drummond, D.Anthony, Orrock, B.Anthony, Thomson, McNab. Subs: Keatings, Crichton, Dursley, Warrender.